With rising gas prices, bicyclists are seen on the roadways throughout Florida more than ever. With this increase in the number of bicyclists comes a corresponding increase in the number of bicycle accidents. 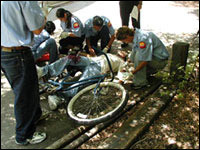 Bicyclists face many dangers on the road, often due to the negligence or recklessness of motorists. Many motorists do not notice, or pay sufficient attention to, bicyclists on the road. No matter how careful they are, bicyclists are very vulnerable. In Florida, a bicycle is considered a vehicle. Accordingly, bicyclists have rights to the road and are subject to the same traffic laws and regulations as motor vehicles. It is the bicyclist’s responsibility to maintain property safety equipment, to obey all traffic lights and signals, and to use proper signaling. Bicycle accident injuries are most often caused by collisions with a motor vehicle, and the injuries sustained in such accidents, even if they were at low-speed, are often severe. Even if the motorist was responsible for the accident, the bicyclist is much more likely to be injured or killed. Although helmets can save lives, helmets do not prevent broken bones, internal injuries, or spinal cord injury. Contact the experienced bicycle accident injury attorneys at Rice for a free consultation to determine whether a bicycle accident action is appropriate in your case. Our attorneys will investigate the circumstances of the accident, conduct witness interviews, and gather all necessary evidence to establish liability and to obtain maximum compensation for the injuries you sustained.